Cuban official media on Monday published new photos of former leader Fidel Castro. The veteran revolutionary lives privately after retiring from politics, with rumors concerning his health arising regularly. 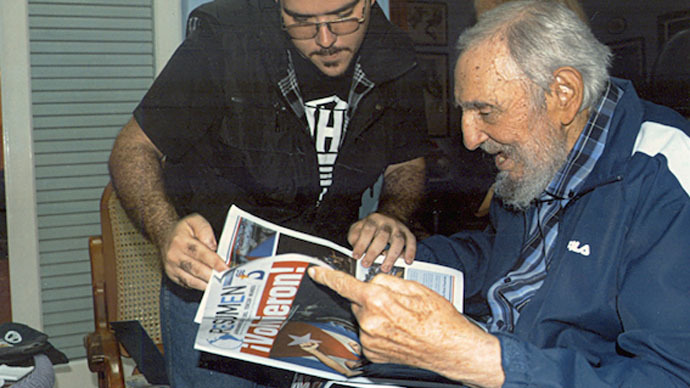 The pictures of Castro, 88, meeting student union leader Randy Perdomo were taken on January 23, he told the state-run newspaper Granma, which published the photos on its website. The 21 pictures showed Castro wearing a blue sweat-suit at his come along with his wife Dalia. He was shown engaged in a conversation with his visitor, watching a video and reading a newspaper. Perdomo said his talks with Castro were as if he were talking to an old friend. The publication seems to disperse speculation of Castro’s deteriorating health, which were spurred by his long silence after the December 17 announcement of historic reengagement with the US by his brother, current Cuban President Raul Castro. Fidel didn’t comment on the reestablishment of diplomatic ties with America till last week, when he published a column warning against blindly trusting Washington, but not opposing the reengagement. Last week the veteran Cuban leader met Brazilian theologian Frei Betto, who said Castro was “in good health, thin but lucid.” Castro’s photos were last released in August when he met with Venezuelan President Nicolas Maduro. He didn’t appear in public since January 2014. Havana seems to follow Fidel’s advice. On Monday it said it wants the US to scale down aid for Cuban dissidents before the two countries would reopen embassies in each other’s capitals. "The way those diplomats act should change in terms of stimulating, organizing, training, supplying and financing elements within our country that act against the interests of ... the government of the Cuban people," said senior Cuban negotiator Josefina Vidal. "The total freedom of movement, which the US side is posing, is tied to a change in the behavior of its diplomatic mission and its officials," she added. The much-hailed break after five decades of confrontation and sanctions prove to pose many obstacles in practice. Those range from disputes over rights for American property nationalized by Cuba after revolution to US holding part of Cuban territory in Guantanamo to Havana sheltering fugitives from the US justice. Fidel Castro stepped down from active politics in 2008 due to deteriorating health. He has been since publishing periodic columns in Cuban newspapers with comments on current affairs.